Harry Potter and the Sorceror’s Stone. My reactions to the two are both the same and extremely different. When I first read Harry Potter, over a decade ago (I was late coming to the series), my enjoyment of the novel and memories of individual, delightful passages were overshadowed by the certainty, deep within myself, that if I could just figure out how to find it, the passage into Rowling’s world would be real. It wouldn’t necessarily be Platform 9 3/4 or even a series of moving bricks in an alley wall in London. It would just be. Even though this book was a children’s novel — tailored in scope, style, genre, and language to a younger audience — I felt an intimate connection to the story, an overwhelming kinship with the entire concept, for reasons I still cannot entirely articulate. And as I explored the series further — at the time, the fourth novel, Harry Potter and the Goblet of Fire, had just been released — this connection only deepened, both my inner child and my intellectual writer and literary analyst satisfied more and more as Rowling’s series, as her writing, became more sophisticated. This is not, however, exactly how I felt after reading The Night Circus. I read this book over several nights by the light from my bedside table into the indecent morning hours, when the house was quiet and I could hear my every sharp intake of breath, every involuntary gasp, every sigh drawn from my lungs. My reactions taut as harp strings, plucked. But for those who haven’t experienced Harry Potter, for those who have not been interested in his story, for those who have avoided the books and movies or shunned them for their popularity, no amount of declaiming the virtues of this series will bring any hint of recognition to their faces. Their eyes remain dark and passive. Their bodies take on a slightly bored posture. No explanation of Harry’s greatness can dent their shell of apathy, no enthusiasm can faze their lackluster resolve. “I will,” he drowsed from a nest of pillows and comforter. “I’ll read it soon,” he mumbled, the last of his voice tumbling into slumber. I needed someone to talk to about this book — though I had no idea how to begin the conversation. Frankly, I wasn’t sure how long it might take me to digest it all. I toyed with the idea of reading it again, immediately, but I was so emotionally spent from reading it the first time, I wasn’t sure I could handle the overload, not quite yet. It is not a simple book. The story is non-linear, the prose as nuanced and subtextual as the magic the illusionist protagonists weave to hold their entire world together. The descriptions are thorough and captivating and rich. The points-of-view within the novel shift (though in clear and obvious and important ways). The tensions — all sorts of tensions — between the characters will web around you, suspend you in an elaborate construction of paper and linen, of filament and silk. But not just for my own amusement and pleasure, I want the possibility of this world to be true, for the world I already know to have the capacity for glorious wonder. I want there to be miracles without judgment and mysteries without fear behind every mundane fold of tent. I don’t want the fantastical to become commonplace. I want the fantastical to become. I tried to find an acceptable book trailer to link to here for you. But though I watched several, none captured the experience of reading the book — or even the spirit of the story itself. Yes, it is a love story, but this part of the plot does not overwhelm the book in the way that one might expect a romance to do. Far from it, in fact. This book instead shows restraint, to tremendous advantage. It wrings your participation, a reaction eventually, deliciously wrought. I think it inevitable that someone, somewhere, will turn this book into a film. And although Hollywood has the technology and budget to make a visually gorgeous live-action movie of it, it could so easily be destroyed, the beauty of the story collapsing in a mess of black widow’s silk and heavy-handedness. I suggest instead that this book would be better translated in the style of MirrorMask (conceived of by Neil Gaiman and Dave McKean), part live-action and part subdued animation, real people and real emotions blended with the elegant, physical translation of a graphic novel into three dimensions. We need fairy tales. They serve a primordial purpose for humanity: the prospect of a life not made bleak by the bounds of reality, by the limitations of the lowest common denominator. As a literary genre, fairy tales have their roots in thousands of years of oral tradition. Called “wonder tales” by scholars, these stories have their ancestral beginnings in the same anthropological need as the bible, as Homer, as Beowulf, as countless others we read in school when we are young and do not always appreciate until we are older. 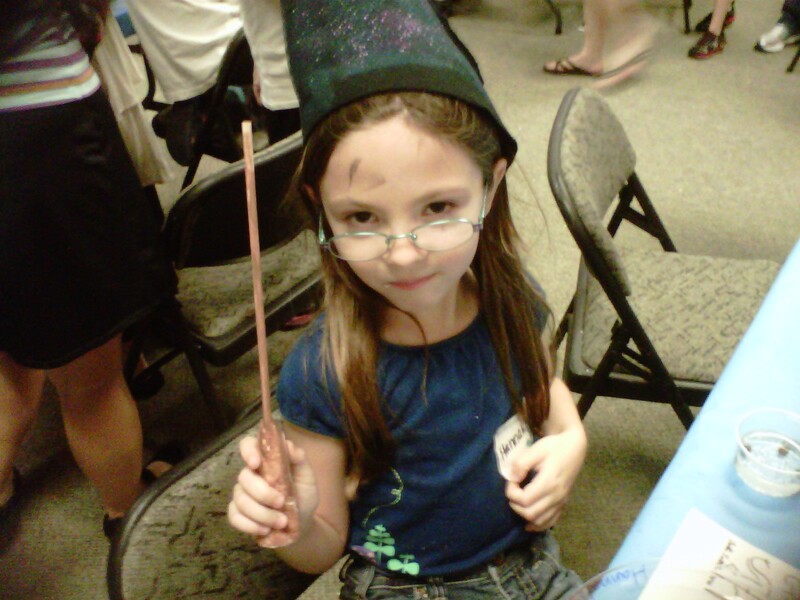 My daughter read the first two Harry Potter novels this summer for the first time. She’s only seven, but she’s an advanced reader. I worried that she might not be ready for books of that length and complexity, but late in the evening, long past her bedtime, I would hear her down the hall giggling, exclaiming to herself, “George is so funny! I can’t believe he and Fred did that.” She wasn’t saying this for anyone’s benefit; she was reacting. She was experiencing. No doubt she didn’t catch everything; I don’t expect her to, not at this age, not on her first reading. But she is feeling the love, and this is more than good enough for me. So many nights this summer I’ve walked into her room and told her it’s time to stop reading for the night. “You should have been asleep two hours ago,” I’ve said. “But, Mommy! I just can’t sleep! I. Can’t. Stop. Reading!” She assumes her agonized face, eyes crinkled behind her turquoise and lavender glasses, her nose slightly pinched, her head thrown back in frustration. “You haven’t really tried yet,” I tell her. But I can’t fault her behavior. I say, “Get to the end of this chapter, and then go to sleep.” She agrees reluctantly, recognizing this compromise is in her favor. It is summer, after all. She doesn’t have to be up too early the next morning; she doesn’t have to do anything the next day but play. When I was a child, I stayed up long past my bedtime reading by the slant of closet light across the diagonal of my bed — on nights when my younger brother beat me to the bathroom, where we would hide out reading, sometimes for an hour or more, until our parents came and found us. It is summer. After the rest of my family has gone to sleep, I will still be awake in my bed, reading by the light of a small lamp. I will hopefully have remembered to wear my glasses. I will curl myself around a book in the way that I cannot do with a Kindle, the pages slicing the silence as they turn, cutting away my opportunity for sleep with every desperate hunger for what happens next. The house will be quiet and I will hear my every sharp intake of breath, every involuntary gasp, every sigh drawn from my lungs. I cannot put the book down. I cannot sleep. School will begin soon, and with it, mornings that start long before the sun has stretched its light across the sky. Our late nights of reading, losing ourselves in stories while the numbers on the clock grow small, are coming to their painful, inevitable end. I am a dreamer, a scrap of red life lost in the black and white. I am a rêveur. Special Guest Post from SJ Over at Snobbery! 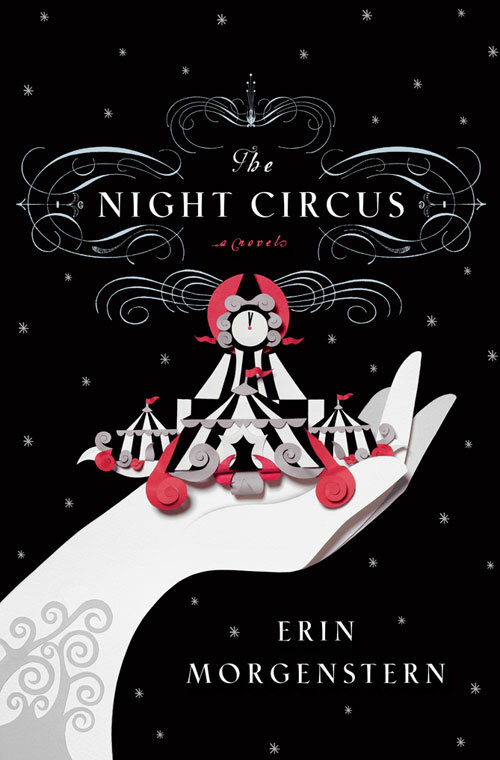 The Night Circus was simply one of the most compelling books I’ve read in the last few years. Watch for an update very soon (this weekend) about a Reveur Revelation Fashion Project. It’s simple. You can participate! I, too, waas totally entranced by that book and read it almost non-stop. Then I kept it by my “reading chair” for about a week and would re-read chapters at random. I rummaged through my scarf drawer for a little-worn red scarf to wear with black to the book club meeting that will discuss this book. I hunger for more books by this author. When the last Harry Potter movie came out, I was so fueled by the hype that I reread the books from one to seven without any stopping in between. i emerged with a greater appreciation of the artistry of JK Rowlings. The books held up with no obvious contridictions and it was amazing that events were forwshadowed two or three books earlier. I know what you mean! Frankly, the love scene (if you’ve read the book, you know what I’m talking about) is one of the most subtly crafted and beautiful love scenes I can remember ever having read. It’s transcendent, in no small part because of its brevity. When I went back and reread it, I was really impressed by her word choices. Such economical language! Oh, and another thing about J.K. Rowling and Harry Potter: she had planned out the entire series before the first book was even published. Of course she had a lot of time to do that, since the first book was rejected for a solid 18 months before any agent would even look at it. An editor I know told me she had written 2 unpublishable novels before HP, too. Amazing! Of course, the writing just got better with each book. I wonder how her seemingly quiet little book coming out this fall is going to be? His name is Tim Burton. Don’t get me wrong, I love Tim’s work. Well, I love his early work. Rêves will require a harder edge than he is capable of. Perhaps Guillermo del Toro is available. But Tim will be drawn to this like a moth to a flame, and Hollywood execs who only read the dust jacket are likely to push it his way as well. As for the tech, I think the tech is already here. Lord of the Rings was 11 years ago, Avatar was 3 years ago. This world (in fact most any world) can be brought to the screen today. I love a lot of Burton’s work up until *Corpse Bride,* particularly the creepier and more gothic stuff. That movie was okay, and most of everything since has been a major disappointment, more style than substance. The black and white theme in the book is Burton’s signature, too — it’s in all his movies.